In the retail industry, they call it ‘shrink’. The term refers to employee theft or fraudulent activity to steal product for personal use or to be resold. For elevators and co-ops, when an employee allows a truck to load up grain and drive off without completing the proper paperwork or receiving authorization, ‘shrink’ takes on a whole new meaning as one loss can easily be worth more than $10,000. On the producer end, farmhands who are familiar with an operation have access to storage bins before harvested crops are even transported to local elevators. One reported grain theft scheme extended over several years, with the trusted employee hauling and selling grain under his own name when he knew his employer was on vacation. And there are always the calculating and bold thieves who watch for an opportunity, drive up to a remote farm, load up a truck and drive away, never to be seen again. Losses such as these can hit hard and be difficult to detect until it’s too late when investigation and recovery are nearly impossible. Recorded video surveillance is a valuable tool for discovering and investigating theft, but the visible presence of camera surveillance is also an excellent deterrent—for both random criminals and employees who may find themselves needing cash and contemplating the risk of siphoning inventory from their employer. Mobile Pro Systems has a variety of surveillance products with many advantages for agribusiness owners. Each comes with a proprietary built-in application which logs every change to the unit’s operating settings that can be configured to send message notifications to authorized personnel when adjustments are made. The MP Status & Control system adds tremendous value for our customers as it includes a layer of security to discourage employee tampering and is available on every platform we offer. 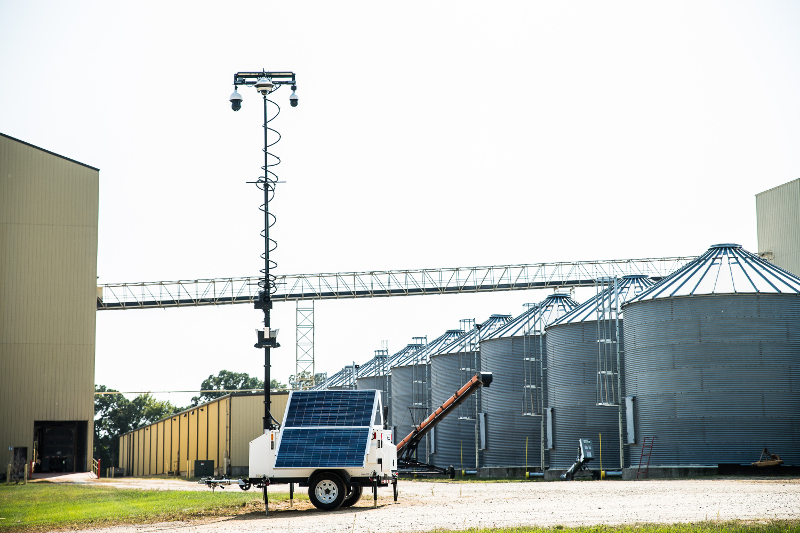 Whether your operation uses the LPR Station to capture license plate images of vehicles entering and leaving facilities, camera trailers at farmsteads or mounted portable camera systems on buildings, bins or poles, you can count on smarter agribusiness solutions from MPS to help prevent loss and keep your business growing.